Arduino is a prototyping platform(AVR uC with some generic circuitry) with its own Software Development IDE(Arduino). Arduio-Hardware is nothing but a AVR uC with some sophisticated Bootloader program residing in it. This Bootloader facilitates the communicaton between Arduino IDE and the Arduino Hardware. Arduino Hardware is very simple. It contains Atmega168/328 as its CPU. Atmega168/328 uC's cannot be interfaced with USB directly. The FT232 IC is used for emulating a COM port. This makes the USB communication easier. 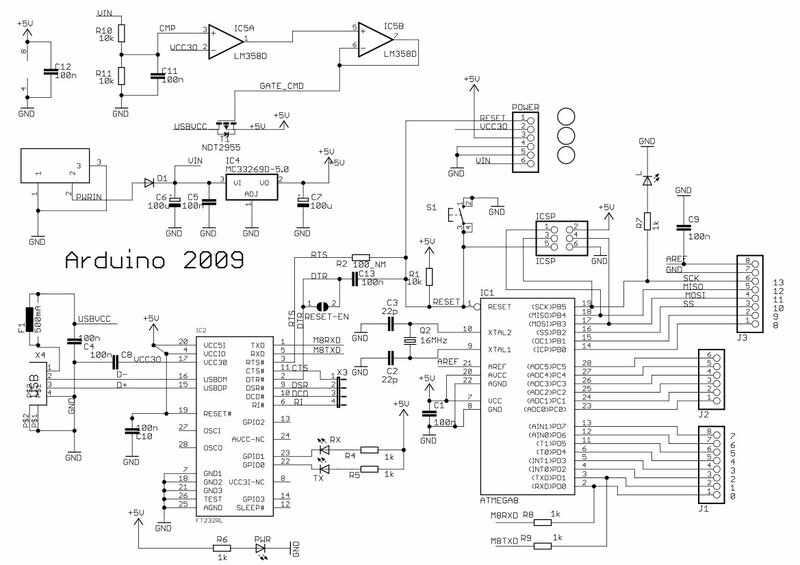 The figure on the right is the Schematic for Arduino Duemilanove. Arduio IDE is based on Processing, a very high level language developed for interactive art. It has several libraries for SPI Communications, Motor control, EEPROM memory access, LCD Display ,etc. Unlike other programming language, programming in Arduino is little bit easier. The code has two compulsory function blocks namely setup() , loop(). Through Up-Coming articles,we'll learn how to construct Arduino from scratch. Watz the diff/: b/w duemilanove and other versions?? Can you explain the Schematic elaborately?